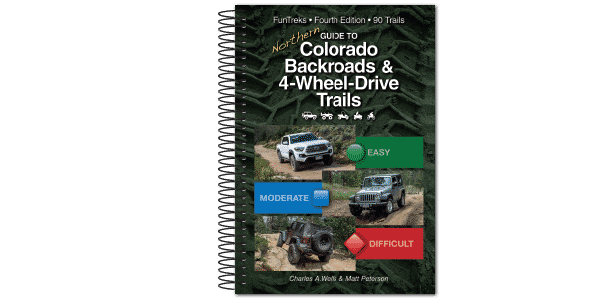 A fun network of forest roads northwest of Gross Reservoir. Great camping, with the best spots located along the south shoreline west of the dam. These spots can only be reached by hiking, biking or aggressive high clearance, 4-wheel-drive vehicle. You can fish, canoe, or kayak, but swimming is not allowed. Great area for unlicensed vehicles. Open May 15 to Nov. 30. A rocky ledge at 0.5 miles is an early test. If you can get past this point, you should be okay the rest of the way. Difficult places near the shoreline are optional. The hill below Waypoint 02 is quite steep with deep ruts. Make sure your vehicle has good articulation to climb back up the hill. Access to FSR 97.1 at Waypoint 02 is now closed. Also, FSR 359 ends at a fenced parking lot high above the reservoir. Plans are underway to enlarge the dam and bring the water level up 130 ft. Camp in numbered spots only. Entire trail has been graded, the fun area near the reservoir has been closed. Optional 359.1C is still challenging.